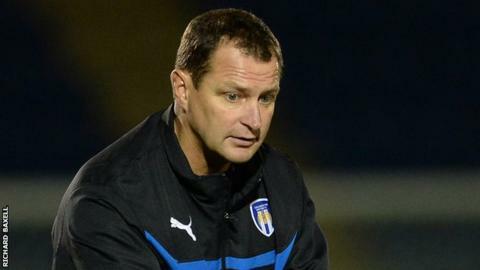 Colchester United chairman Robbie Cowling says Tony Humes will remain as manager even if the club are relegated to League Two this season. The U's are four points from safety with three games to play after Saturday's 2-2 draw with Scunthorpe extended their winless run to three. Cowling told BBC Essex: "Tony is the manager of Colchester, I'm extremely pleased with what he's doing. "He's going to be the manager next season." Humes replaced Joe Dunne as Colchester manager in September, having previously been in charge of the club's academy. He has won 14 of his 42 matches in charge, but the club still remain 23rd in the third tier. Alan Devonshire, who left Conference side Braintree last week, had been linked to the job, but Cowling dismissed those as rumours. "I can tell you categorically that there is no truth in that whatsoever."